Dreamboats and Petticoats is at the Theatre Royal Brighton until Saturday. Picture: Pamela Raith Photography. It’s not the first time Dreamboats and Petticoats has been to Brighton, and last night it was clear to see why. Opening at the Theatre Royal for a week-long run, the Olivier Award-nominated musical was a hit with the audience from the minute it started. Set in 1961 – in what many would describe as music’s golden era – it features songs from some of the top artists of the time like Roy Orbison, The Shadows, Eddie Cochran, and Billy Fury. The guy sitting in front of me was certainly enjoying it, as every time a well-known tune came on he was joining in with gusto! The story centre around young musicians Norman and Bobby, who compete to win a national song writing competition and, more importantly, the attention of the gorgeous Sue. For me, Bobby (Alistair Higgins) and Laura (Elizabeth Carter) were the stand-out stars. Both had voices that were sweet and gentle, but really powerful when it was required in the bigger numbers. I’m not old enough to remember this time in the world, but I was certainly transported back there through the familiar music, fabulous costumes and energetic dance routines. All the music is played live on stage, too, which definitely adds to the atmosphere. 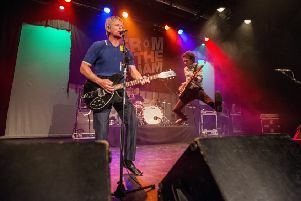 This run of the show is to celebrate 10 years since the release of the Dreamboats and Petticoats compilation CD, which is what inspired the stage show to be written a year later. Since then, it has played to audiences around the country, and in the West End, and continues to be a firm favourite. After last night, I’m definitely in the fan club.